Director/Screenplay – Bryan Bertino, Story – Bryan Bertino & Sam Esmail, Producers – Bryan Bertino, Adrienne Biddle, Jason Blum, Marc Platt & Adam Siegel, Photography – Brandon Cox, Visual Effects – The VFX Legion (Supervisor – James David Hattin), Special Effects Supervisor – Mark Gullesserian, Production Design – Jennifer Spence. Production Company – Marc Platt/Blumhouse. Husband and wife Tom and Emmy find a video camera left on their doorstep, along with a note telling them they won it after entering a prize draw at the mall. So too does university student Beth living on her own. Both parties are told to film everything – only to find after activating it, they cannot turn the cameras off. 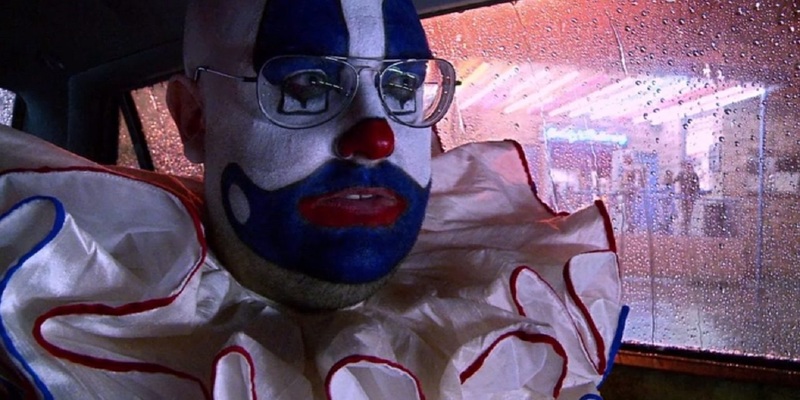 A third camera is received by Leonard, a slacker who lives at home with his mother, along with instructions to put on a clown suit and makeup that has also been left for him. As Tom and Emmy film everything that happens, they find sinister, unseen figures leaving them taunting videotapes threatening their children, even entering their house. Beth is similarly terrorised by figures outside her apartment. Meanwhile, Leonard is left a series of notes directing him to film himself doing increasingly more outrageous things. I was very impressed a few years ago with the home invasion thriller The Strangers (2008). It was a debut feature from Bryan Bertino who demonstrated considerable style. One waited some years for Bertino to make a follow-up. He announced several projects, including The Strangers 2 and Mockingbird, but both of these have spent a long time in pre-production, although he did produce The Blackcoat’s Daughter/February (2015), He’s Out There (2017), Stephanie (2017), Hurt (2018) and The Strangers: Prey at Night (2018). Mockingbird eventually arrived after receiving co-production financing from Jason Blum’s Blumhouse – see below for Jason Blum’s other credits – and did the rounds of some fantastic film festivals before disappearing into cable release. The surprise when one sits down to watch Mockingbird is that Bryan Bertino shoots it in the Found Footage format. When Bertino first announced the film back in 2008, we were still a year away from the widespread hit of Paranormal Activity (2007) in 2009, after which the style went meteoric among the horror genre. One is not sure if Bertino has predicted much of the Found footage genre or else it is a case of him (or the producers) subsequently deciding that the way to tell the story he had would be to adapt it to the Found Footage format. Certainly, what Bryan Bertino did with The Strangers holds a good deal of promise. Mockingbird has him back in the same territory featuring home invasion by mysterious unseen figures. One sat down to watch with the expectation that he would be able to do amazing things that sit head and shoulders above every other hack director exploiting the Found Footage format. For a good way in, Mockingbird holds you to it as the storyline flips between the various character threads as we try and figure out what the increasingly sinister game that is being played on them is, particularly the scenes involving the peculiarly genial clown (Barak Hardley). It almost feels like we are in a Found Footage equivalent of the opening sections of Lost Highway (1997). On the other hand, I ended up disappointed with Mockingbird. Bertino sets it up well, gets off a few moderately tense shocks – although nothing that exists in the eerie league of The Strangers. You keep expecting the film to build up to a wild payoff but unfortunately when this comes, it proves to be underwhelming. The problem, one suspects, is that Mockingbird has been in the planning so long – seven years – that what Bryan Bertino originally intended to do with the film has been overtaken by other films in the genre featuring malevolent psychos with handheld cameras stalking people – see Evil Things (2009), 388 Arletta (2011) and the amazing The Poughkeepsie Tapes (2007) – and that what may have been an original idea in 2008 no longer seems remarkable. Bryan Bertino next went on to make The Monster (2016). Jason Blum and his Blumhouse production company have produced a number of other genre films including:- Hamlet (2000), Paranormal Activity (2007) and sequels, Insidious (2010) and sequels, Tooth Fairy (2010), The Bay (2012), The Lords of Salem (2012), The River (tv series, 2012), Sinister (2012) and sequel, Dark Skies (2013), Oculus (2013), The Purge (2013) and sequels, the tv mini-series Ascension (2014), Creep (2014), Jessabelle (2014), Mercy (2014), Not Safe for Work (2014), Ouija (2014) and sequel, 13 Sins (2014), The Town That Dreaded Sundown (2014), Unfriended/Cybernatural (2014), Area 51 (2015), The Boy Next Door (2015), Curve (2015), The Gallows (2015), The Gift (2015), Jem and the Holograms (2015), The Lazarus Effect (2015), Martyrs (2015), Visions (2015), The Visit (2015), The Darkness (2016), Hush (2016), Incarnate (2016), The Veil (2016), Viral (2016), Amityville: The Awakening (2017), Get Out (2017), Happy Death Day (2017), The Keeping Hours (2017), Split (2017), Stephanie (2017), Bloodline (2018), Cam (2018), Delirium (2018), Halloween (2018), Seven in Heaven (2018), Truth or Dare (2018), Upgrade (2018), Ma (2019), Relive (2019) and Sweetheart (2019).